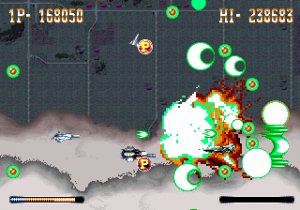 To the gaming world at large, the now defunct Japanese videog ame software developer Technosoft is by far best known for their sequence of scrolling shooters collectively known as the Thunder Force series. 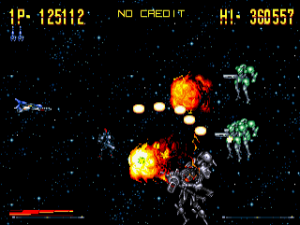 To a lesser extent, mainly in Real-time strategy circles, they have some notoriety for creating Herzog Zwei for the Sega Genesis; a game that in recent times has been credited for its significance influence on the now popular RTS genre. Besides these footnotes, Technosoft’s software library mainly consists of obscure titles, with few of them ever leaving Japanese shores. Several hidden gems can be found in this library. 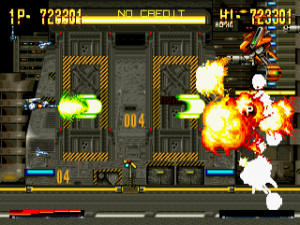 One in particular is a simultaneous two-player horizontal scrolling shooter, very much resembling its Thunder Force brethren, that was created during one of the rare moments Technosoft developed for the Arcade platform. 1993 saw the release of Hyper Duel, an overlooked, but excellent shooter in its own right, and a game that some even regard as superior to the Thunder Force games. 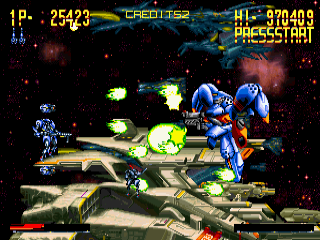 Without the benefit of an English translation, the story of Hyper Duel appears to involve a militant/alien group threatening Earth as par to typical scrolling shooter plots. In response, Earth deploys their specially designed machines, the “Buster Gears”, to combat them. The unique ability of the Buster Gears allows them to switch between two forms. One being a conventional spaceship “Fighter” mode, and the other being a bipedal humanoid giant robot “Armor” mode (for the anime fans, think Macross Valkyries without the in between GERWALK form). In game, the transformation mechanism of the Buster Gears works seamlessly, thanks to Hyper Duel‘s relatively simple control scheme. Besides the control stick, there are only two buttons in Hyper Duel, one for shooting in Fighter mode, and the other for shooting in Armor mode. Alternating between these buttons will transform your craft at will, with only a slight delay due to the transformation animation. 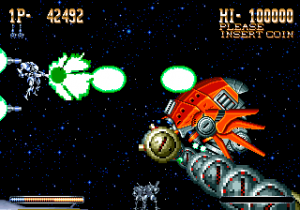 In Fighter mode, the Buster Gear acts as a typical shooting game ship, firing directly in front of itself. Fighter mode has greater speed and maneuverability, and is compact enough to be the ideal mode for dodging tight bullet patterns. 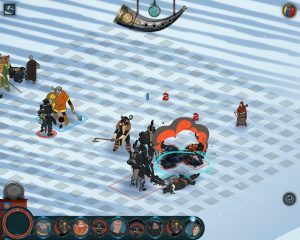 On the other hand, Armor mode sacrifices that speed and mobility, making your craft a larger target as well. The trade off is your shots become more powerful, and by moving up/down, you can aim your gun up to 45 degrees above or below you. 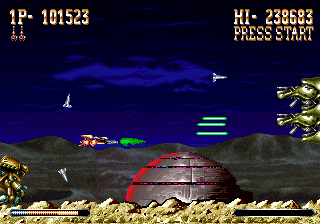 Both Fighter and Armor mode shots are upgraded simultaneously by collecting the ‘P’ power-up icons. 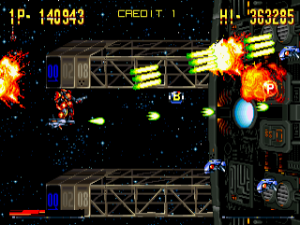 In addition, by holding both buttons down together, you can activate a special attack where two satellites emerge from your ship and hover directly above and below you respectively. The satellites’ pattern of attack are determined by what mode you’re in. While in Fighter mode, they remain stationary and fire across the entire screen in a circular motion, and in Armor mode they slowly rotate around you, firing in front with a sweeping motion. Use of the special attack is dictated by a meter at the bottom of the screen which gradually depletes as it is used. When the meter is fully depleted, the satellites stop firing, but still retain some slight usefulness due to the fact that they can block out smaller enemy fire. The meter slowly recharges while the satellites remain inactive and a large chunk of it can be refilled by collecting the ‘B’ icons given to you by defeating large enemies, or by getting a free one (and a free ‘P’ icon) upon losing a life. Your special attack meter, along with your regular attack power level, resets upon death. The centerpiece mech of the game. Piloted by Keith Spader, the generic heroic anime male looking guy. It is balanced in speed and power. 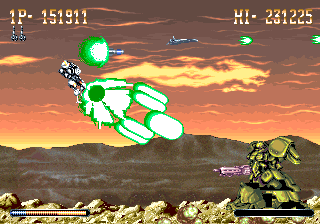 Fires a regular shot that evolves into a spread shot after power-ups in Fighter mode and fires a stream of large plasma discs in Armor mode. Its special shot sprays the area with pulse blasts. Excels in speed while retaining decent power, remaining quick even in Armor mode, and having the highest fire rate. Piloted by Lisa Rowland, resembling the spunky female tomboy archetype. 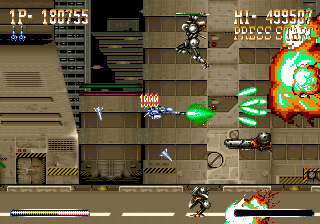 The regular shot fires long, straight, concentrated laser beams in Fighter mode which turn into fatter lasers in Armor mode. Has a very useful laser special attack due to the fact that it can clip through walls and enemies. The slow but powerful one. Piloted by Dr. B. Lloyd, who looks like the mysterious older scientist character. Fires a somewhat crescent shaped shot in Fighter mode, but uniquely, it has a short range, shotgun-esque spray in Armor mode. This attack puts you at great risk of getting hit, but is very devastating. Its special shot is an also powerful proximity grenade launcher. If the Buster Gears’ latent capabilities weren’t enough, you can also enlist the aid of up to three helper mini-machines that can add to your firepower and act as shields, since they each can take five hits before exploding. These helpers are activated by collecting an icon that alternates between ‘T’ for “Tracer” and ‘G’ for “Gunner”. Tracers resemble your Buster Gear in Fighter mode and follow behind you via your traveled pathway, firing directly forward when they get an enemy in their sights. Gunners are little mechs that home in on enemies independent of you and shoot them down with their machine guns. Determining what combination of helpers work best for the situation is a given. The autonomy of Gunners give them a better ability to cover you/take out stray enemies, but they can sometimes trap themselves and/or purposely run into bullets. Tracers allow you some degree of control over their actions, but they move sluggishly behind your craft, which tend to leave them open to enemy fire more. 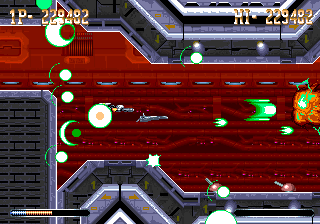 Gameplay in Hyper Duel in very much akin to the fast paced style of Technosoft shooters. The design of the game is very accommodating to the mode switching of the Buster Gears, doing a good job of creating opportunities that exploit the strengths of each respective mode, without making one mode mandatory or entirely useless for long stretches. 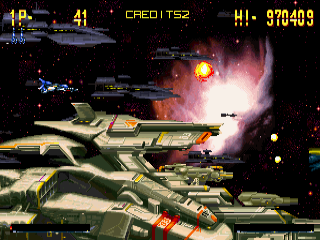 An exclusive feature to Hyper Duel from other Technosoft shmups is the use of a ranking system. Basically, the amount of power-ups collected will increase rank, which most directly increases the intensity of bullets fired at you. 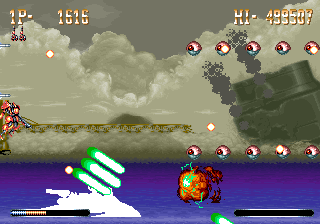 This also has various effects on some of the bosses. The sixth boss “Nightmare” for example, can truly live up to his name on high rank with its bullet showers. Besides the obvious means of destroying enemies, you can gain extra points during a stage by collecting icons when the respective thing it increases is maxed out, or by not moving at all, which slowly and incrementally increases your score. At the end of every stage, bonus points are awarded for completing the stage, the number of helpers remaining, destroying every enemy in the stage, and the amount remaining on your special meter. 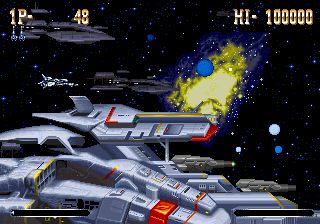 When the first of the Hyper Duel‘s eight stages begins, you find yourself right in the middle of a heated battleship fight. Throughout the game, your time is spent traversing between space and Earth, fighting in locations such as an open, barren, desert, an O’Neil cylinder style space colony right before it’s blasted out of space and crashed on Earth’s surface, and the nightlife of an enemy infested city. During these travels, a particular adversary you’ll encounter recurringly is rouge prototype Buster Gear BG-00G “Black Angel”; a large, powerful mech controlled entirely by A.I who closely fulfills the role of your rival, acting as friend or foe depending on the situation. All of this culminates into an intense final battle. 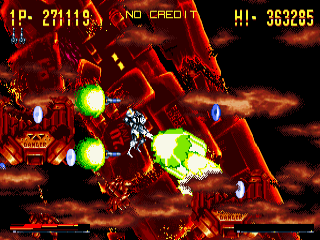 A frantic and punishing struggle where the game (and BGM tune of the same name) earns its title, taking place directly above the Earth with its surface looming below.As a side note, the game contains some strangely coincidental Gundam references, leading one to believe the developers may have drawn some amount of inspiration from the series. Obvious examples include the previously mentioned colony drop sequence that closely mirrors the ones seen in several Gundam shows. Another is the game’s third boss, “I.W.A.O”, who looks so similar to a Zaku you have to wonder how Technosoft got away with Bandai not attempting to sue them. 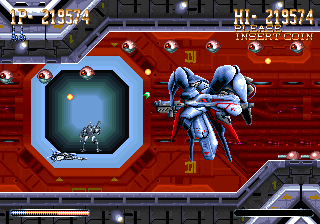 Hyper Duel was ported to the Sega Saturn a few years after its Arcade release. 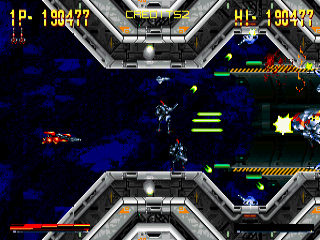 However, in addition to including the unaltered, original Arcade version, Technosoft went the extra mile and added an entirely new revision of the game to the package, known as the “Saturn Mode”. 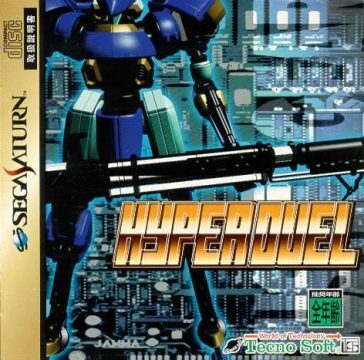 Saturn Mode gives Hyper Duel a cosmetic overhaul. 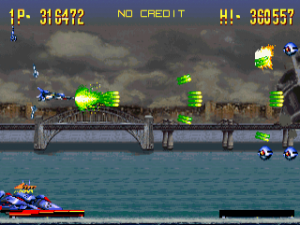 The character select screen is redone, and the stages and sprites are given brighter color palette as opposed to the duller, washed out look of the original. Much more detail is added to the sprites and backgrounds, and some sprites are even redrawn entirely. It also implements some gameplay tweaks and changes. Among them, a third button is added for Armor mode that when held would lock the Buster Gear’s aim in place. This allows moving and aiming in Armor mode to be independent of each other, correcting an admittedly annoying oversight of the original. There are other more subtle tweaks that make the game seem harder. For instance, in the original, the third Zaku boss’s bullets were destructible, but they aren’t in Saturn Mode. The arcade Hyper Duel soundtrack is the debut composition of game music composer Hyakutaro Tsukumo, who became Technosoft’s primary composer during their later days, and then worked mostly in the doujin scene after their demise. Presently, he’s been re-releasing previous Technosoft material along with some new stuff under the Factory Noise & AG label, of which he’s a member of. His most widely known work is the soundtrack to Thunder Force V and his style is a distinct brand of driving, energetic, synth-rock with the occasional piano track or use of piano in his normal fare. While Hyper Duel‘s soundtrack is decent in its Arcade form, the hardware it was programmed on makes it feel too dated and thus forgettable. 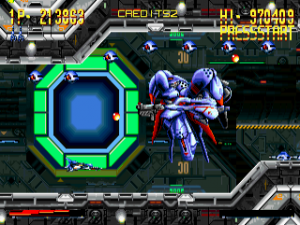 That said, likely the most impressive improvement Saturn Mode offers is the revised soundtrack. The entire thing was rearranged by Tsukumo using updated equipment, making it sound more in line with his modern synth melodies. The result is absolutely phenomenal, and transforms Hyper Duel‘s soundtrack to some of his best work, as if you were listening to a completely different soundtrack. This new soundtrack, along with the other aforementioned improvements, make the Saturn Mode of Hyper Duel the clear definitive version. Unfortunately, the Saturn port of Hyper Duel has since become one of the Saturn’s rarest games, and it regularly demands triple digit prices when it occasionally pops up on Ebay. Those unfazed by the financial requirements and are willing to poke around for it a bit are encouraged to obtain it immediately.